Every year millions of people pass through the doors of the Gare SNCF de Marne-la-Vallée – Chessy, the majority end up in the Disneyland Paris parks or hotels, others will just be passing through on their way to other destinations across Europe; this is the life of the number one inter-connection station in France. The station and Disneyland Paris are so intrinsically linked that it is almost difficult to imagine the resort without the station that brings the magic so close that 37 million Europeans are now just one train change away! When the Walt Disney Company and the French State signed their agreement (La convention pour la création et l’exploitation d’Euro Disneyland en France) on the 24th March 1987, the agreement mentioned the creation of a station for the LGV Interconexion Est which is a high-speed line connecting the existing North and South East line, this interconnection opened in May 1994. At the time, the Chief architect of the French Railways described the new station as ‘helping tilting the balance of the Ile-de-France back towards the east’, from an already wealthy west. When reading the 1987 agreement, Article 11 named ‘Extension R.E.R. – T.G.V.’ outlines an extension of the existing RER A line (previously terminating at Torcy), and the new terminal station which should be able to handle 10,500 passengers per hour. The exterior of the station was to be designed by the winner of an architecture competition run by the RATP (Régie Autonome des Transports Parisiens) with Euro Disney S.C.A. being allowed to take an observer role. If Disneyland Park is known for it’s castle with its impressive spires, its clear that some inspiration has come from the castled world to this station with its spired front, or according to the architects Arep (JM Duthileul, E Tricaud and F Bonnefille) ‘Our task was to express a real station in an artificial world’, the glass walls of the station are designed in order to show the impressive TGV trains to an audience who may not take the train, this is achieved as when we leave the yellow Disney busses from our hotels, we must pass the stations glass wall in which we are able to see all the way down to the platform, in this respect the station is very much like that of Roissy Charles-de-Gaulle and Lille-Europe. What really is interesting about the link between Euro Disney S.C.A. and the construction of this station is the amount of constraints put onto the building, for example the agreement states that the station exit and the entry to Disneyland Park could not be more than 150 meters (the final distance is in fact 125 meters) and that Euro Disney S.C.A. should do their best to ensure a direct access to the park from the station (something that new security checks prohibit). The RER station and TGV station are technically different stations, one half is managed by the RATP (RER) and the TGV half is manged by the SNCF, however the two share the same style of architecture and one can easily traverse between the two stations. 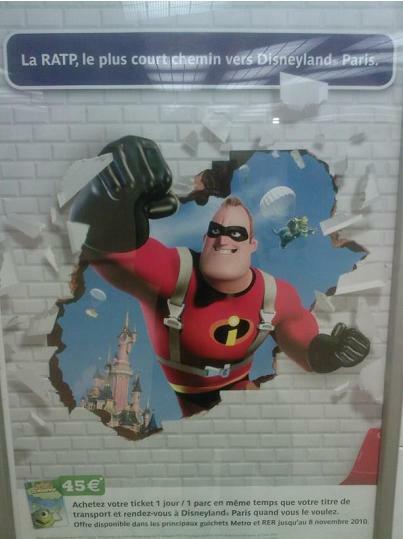 RATP, the quickest way to Disneyland Paris. The 1987 agreement also set how Euro Disneyland would market this new rail link that had been built in order to service the resort (after all, this new line extension and station will have cost the RATP a lot of money, it is only natural they wanted a return on their investment), Euro Disney S.C.A. were not permitted to include parking charges in their park admission ticket (in order to discourage car usage). They were also forced to encourage guests to take the RER from Central Paris to the resort in their advertising in the form of using the approximate time taken from Nation station to the resort. The new extended RER opened on April 1st 1992, 12 days before the opening of the resort, now guests could easily reach Disneyland Paris, and local residents could take the new rail link and arrive in central Paris much quicker than ever before. It would be a further two years before the high-speed rail link would open in 1994. 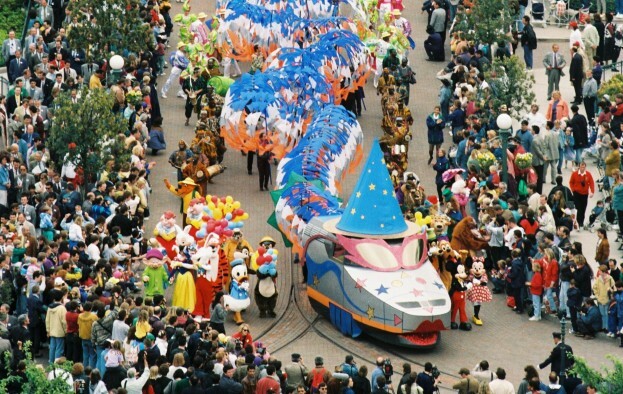 In 1992, the capital city of Paris became that little bit closer to the magic, on the 29th May 1994 the rest of mainland Europe got a little bit closer with the opening of the new TGV high-speed link, which linked Disneyland Paris with major French cities such as Lille, Lyon and Bordeaux. This was celebrated by a paper train containing 500 people stretching from Disney Village to Fantasyland, such was the enormity of this train that when the front of the train was in the park, the rear was still in the esplanade. On board this first arrival was Sir Richard Branson, who was met Mr. Philippe Bourguignon (who at the time was president of Euro Disney S.C.A.) at the Gare du Marne-la-Vallée Chessy. 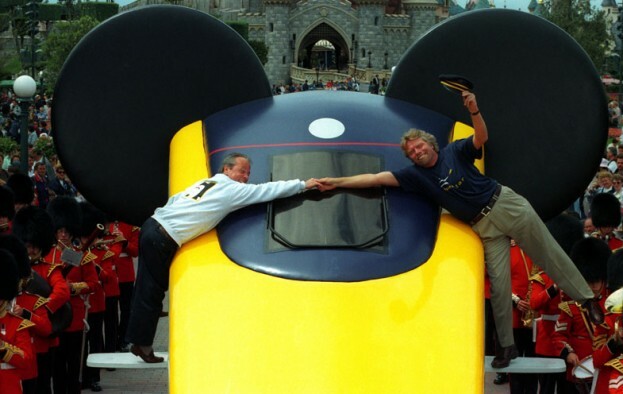 To celebrate a float was created representing the classic Eurostar train front with two Mickey ears with a ‘platform’ on either side of the train acting as a place for the two gentlemen to stand, this was accompanied by Grenadier guards. Just one year later, the Thalys international high speed link (linking France to Belgium, the Netherlands and Germany) arrived in Marne-la-Vallée. 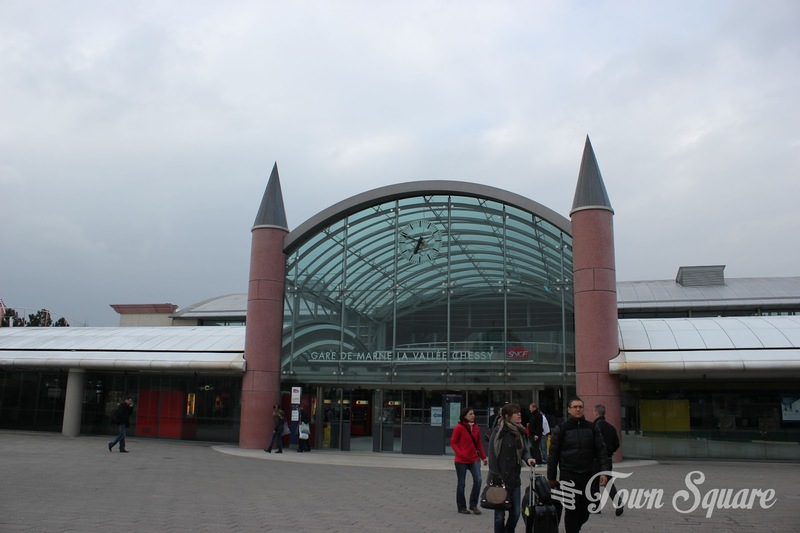 Visiting Disneyland Paris by rail was becoming increasingly easy, with over 70 trains arriving each day and Marne-la-Vallée Chessy becomes the number one station for inter-connections in France. In fact, getting to Disneyland Paris by rail has never been cheaper as in 2013 the low-cost TGV ‘OuiGo’ was launched at the Marne-la-Vallée Chessy station linking Marne-la-Vallée to Lyon, Marseille and Montpellier for as low as €15 for a single journey. The future of this vibrant, busy suburban Paris station looks bright as even more services get added, as even more of us sit back, relax and let the train do the work.